At the end of another academic year (my 16th! ), I can look back on a year where I spent an enormous amount of time grading assessments. This past semester I have three modules with three separate assessments (usually two assignments and an exam). The class size is about 60 students on average - that's approximately 540 assessments to grade. For my remaining module, I have weekly labs that must be graded - so there are about 10 of these over the semester. With a class size of 35, this means around 350 separate sets of corrections. That's almost 900 assessments to grade - all of this takes a long time! For students, they too often feel that they are constantly under pressure of many deadlines throughout the semester, with something due almost every week. I'm a believer of Continuous Assessment being continuous (the notion of "repeating" a CA drives me mad!). By this I mean that it should be on a regular basis. It's hard work keeping up with weekly lab assessments, but I feel students get more out of it by building on their learning, and building up their grades on a weekly basis. But where should the line be before I cross over into over-assessment? If students are constantly under delivery deadlines (and the threat of penalties if they miss them), where do they find time to experiment, read extra material, examine case studies, take a break, and of course - prepare for exams? A single assignment, and a single exam seems to be the norm in many modules. This is great if you can use them to assess separate Learning Outcome, but it does not always happen that there is a neat division between Learning Outcomes. Designing assessments can be difficult because it is hard to get the balance right. 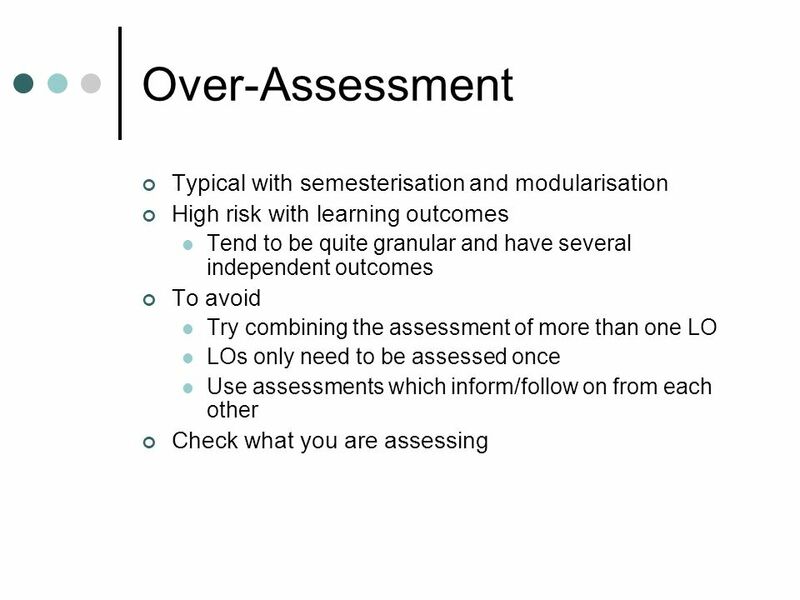 Reducing the number of assessments takes the pressure off students, but we still need to ensure that the Learning Outcomes are assessed adequately. My thoughts - no one else's.